Hello, my magician friends around the world...The new TGM is ready! Welcome back to the pages of TGM - volume Four, yes four, no less, issue number one. Read the contents of the very first issue of the new volume below and you are sure to run for it. 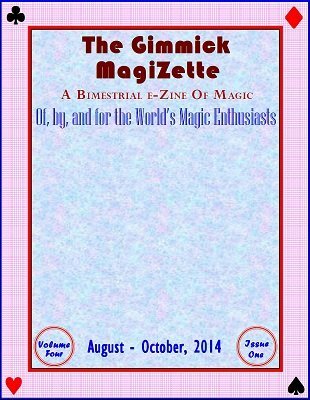 This issue is a staggering collection of articles, magic effects (I hate the word 'trick' - magicians do 'magic' whereas 'tricks' are done by the 'tricksters'), jokes, cartoons, news and views and more. Solyl Says - simple tittle-tattles of Solyl. Magic as Entertainment by Harold Taylor is another installment from his book with the same title. Magicians in the Rig-Veda by H.D. Velankar is an interesting reading that you may find. MagicIan Adair Column - a chit-chat and magic column by Ian Adair of U.K. Broken and Restored Matchstick-close-up caper by Indian Illusionist P.K. Ilango. Tubulos by Aldo Colombini is a great rope item for children's entertainers. Brush Fire by Guy M. Townsend is an impromptu version of the Joshua Jay effect Inferno - outstanding! Comedy Sandwich by Sukesh Patnaik - interesting, offbeat and with Guy M. Townsend addendum. The Bullet Catching Trick - My Way by Gora Datta is the deadly effect has now been safe with screaming climax. ESPrediction by Solyl Kundu is not an earth-shattering effect, but an ESP card experiment you would love to do. Bold Change by Fabian is certainly bold but not that difficult to use. Miscellaneous section caters Cartoon, Jokes, Photo Quiz, an apologia and more. News and Views around the World give you some idea what is happening in this part of the world.